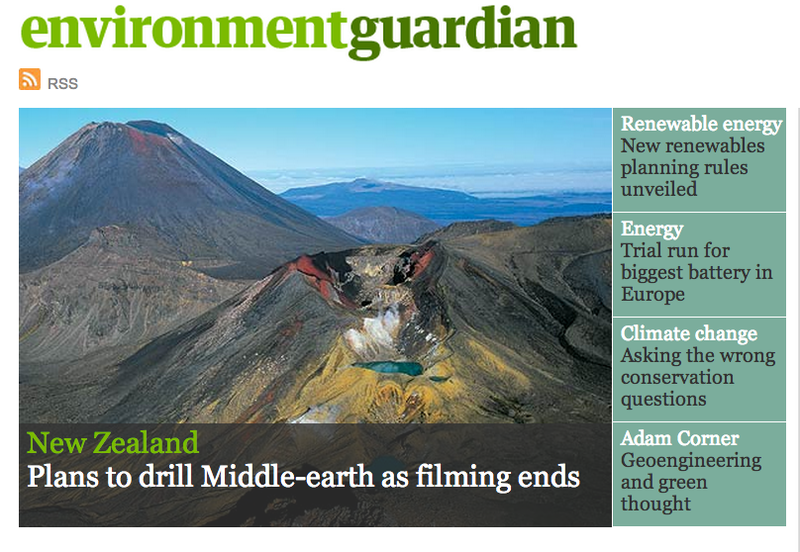 Yep, we made it to The Guardian Environment’s front page – for all the wrong reasons. Our charming Prime Minister – and Minister of Tourism – has excelled himself with his latest video promoting drilling, fracking and the general digging up of our beautiful country and its offshore marine environment. The video was released last week. While we could go on – and on – The Guardian’s summed it for us – . Blogger Graham Readfearn points out the irony of the moves by our Government to exploit what Key calls “our natural resources” – an irony that hasn’t escaped many of us here in NZ. Clearly tourism in NZ exists outside of the Lord of the Rings phenomenon. It is, after all, a fantastic country to visit. However, how long will the tourism last if it ruins its environment through mineral extraction? And how long do you think those minerals will last? What then? I really can’t understand why all these right wing politicians can only think of environmentally destructive and socially divisive ways of providing employment and earning money when their are so many environmentally constructive and socially enhancing alternatives. To those who have visited our shores, the prospect of digging up NZ to sell it off to the highest international corporate bidder is clearly as bizarre a concept as it is to us. PreviousWhat Is Coal Action Network Aotearoa?